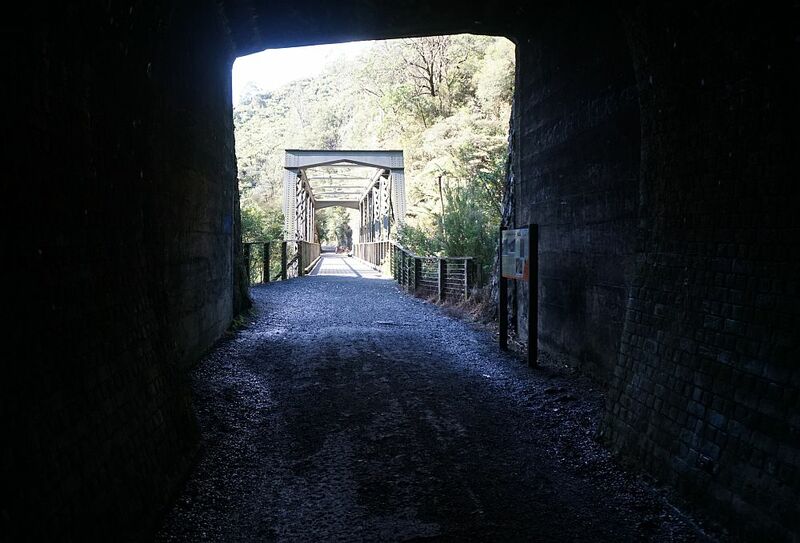 This walk starts at the Karangahake Reserve, crosses the Ohinemuri River, takes the historic walkway to the western portal rail bridge, through the rail tunnel, and follows the historic walkway/cycleway to Waitawheta Rd and Owharoa Falls. Return by the historic walkway to the reserve. The rail tunnel is over 1km long, and so straight that it’s possible to look from one end to the other. There is a very slight downward slope from the eastern end to the western end. 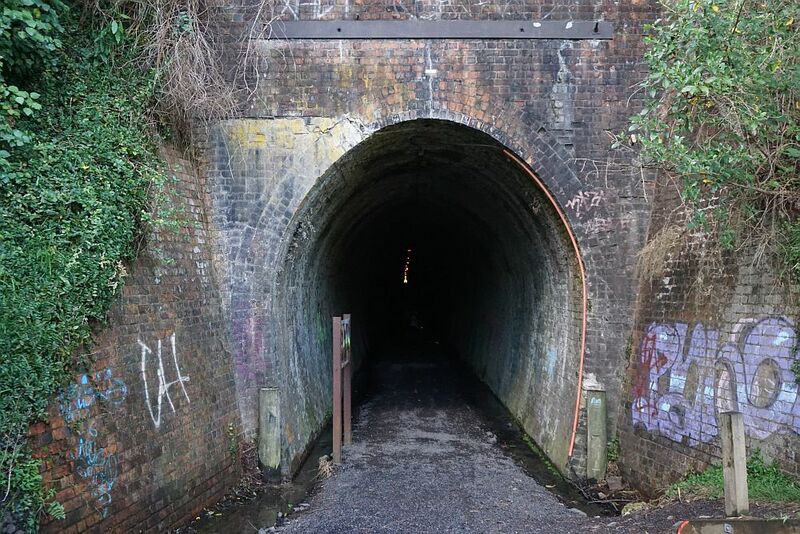 The tunnel is lit, but it’s still advisable to bring a torch. There is parking, toilet facilities, and a picnic area at the reserve. Information about the walkways is available on the DoC web site. 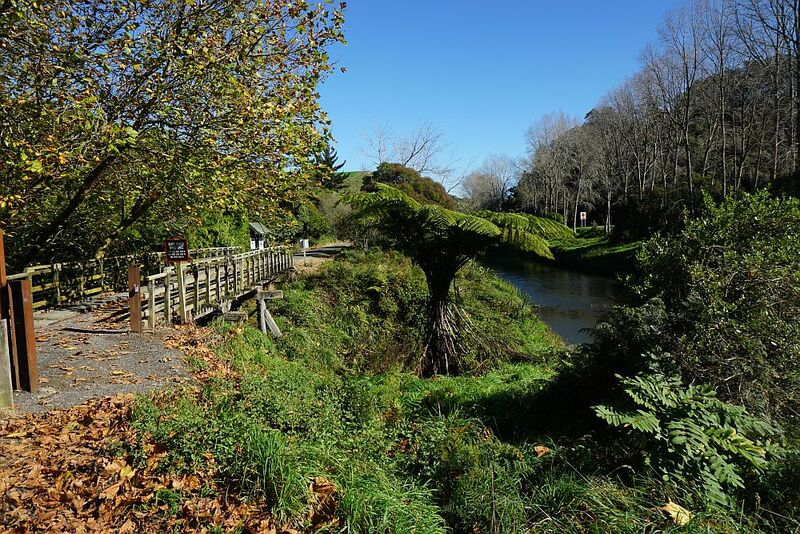 There are two cafes/restaurants near the reserve, and one near the Owharoa Falls. 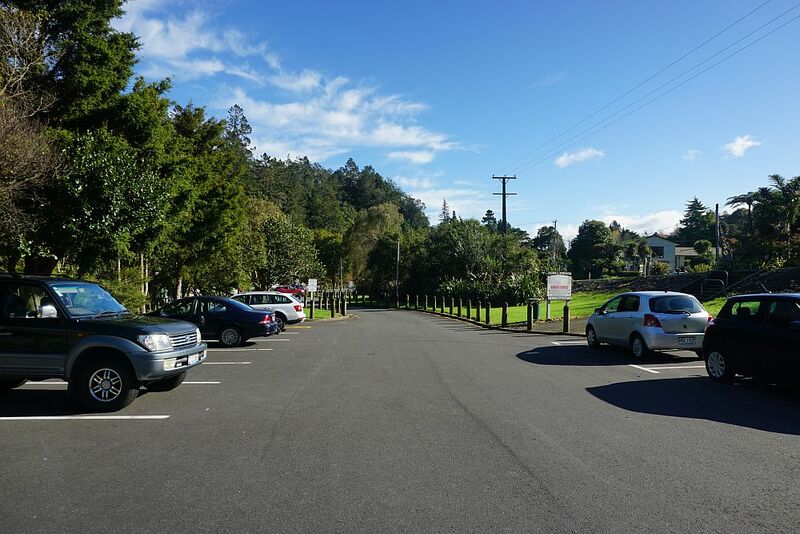 The parking area by the Karangahake Reserve. Sheltered benches in front of the suspension bridge across the Ohinemuri River. 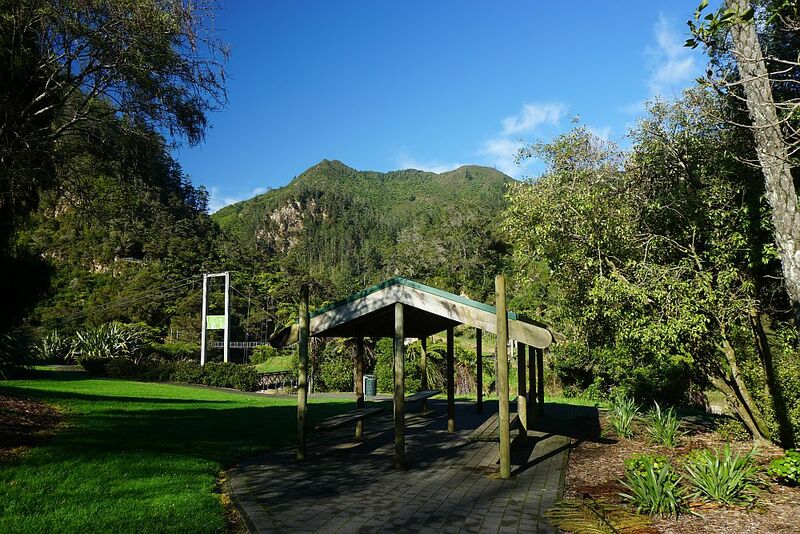 The bridge across the Waitawheta River can be seen directly behind the Ohinemuri River bridge, and the peak of Mt Karangahake towers above the bridges. 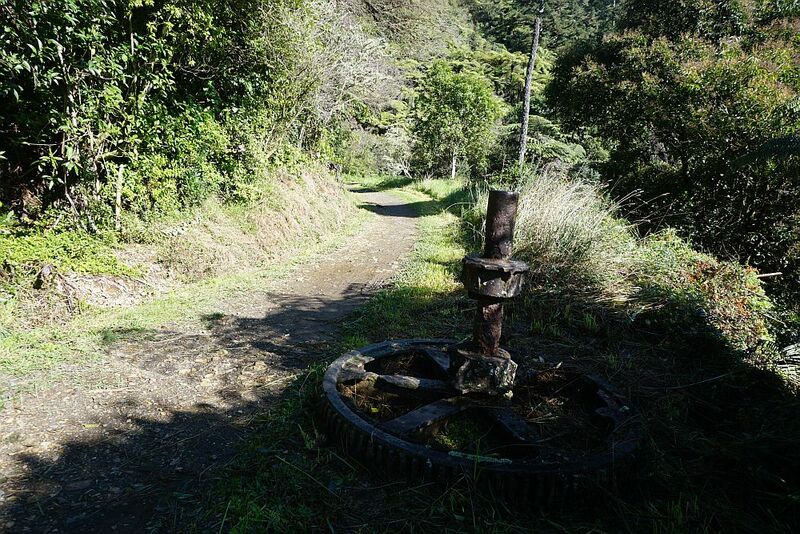 See a previous blog post for a walk to the peak of Mt Karangahake. The suspension bridge across the Ohinemuri River. Remnants from the gold mining days are seen in several locations along the walkway. 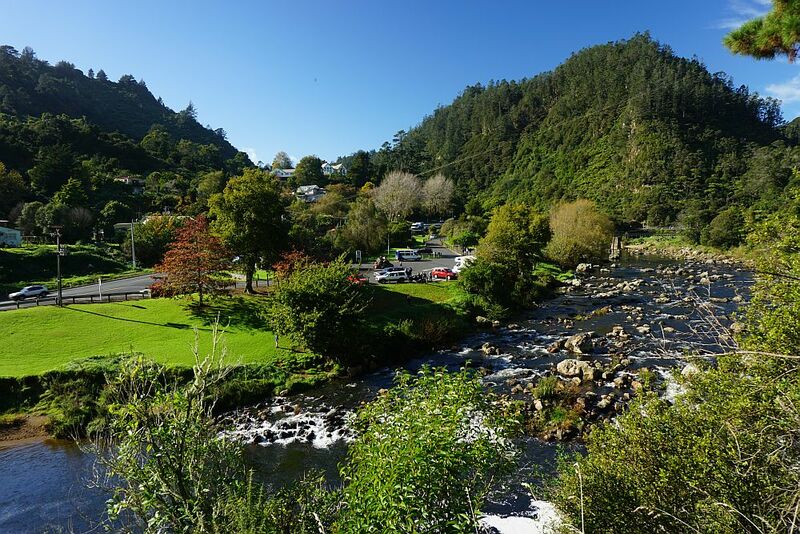 Looking back across the Ohinemuri River to the parking area and the Karangahake Reserve from the walkway. 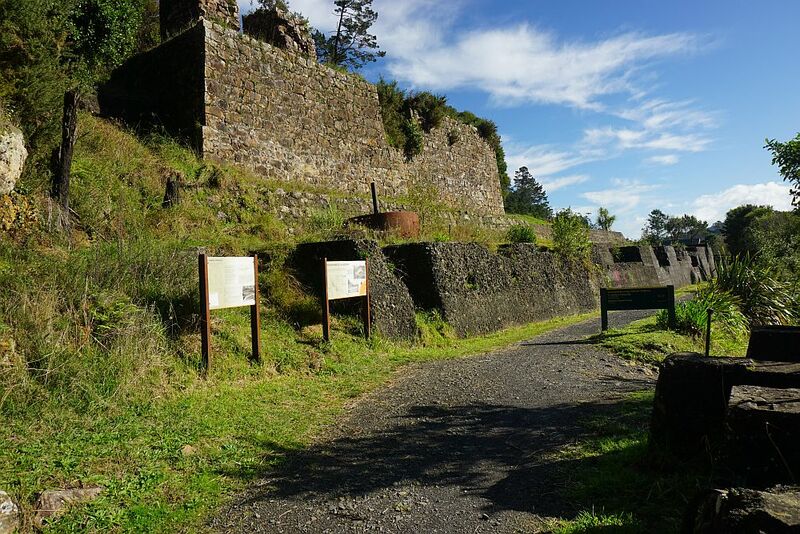 Remains of the Crown Battery near the Western Portal Bridge. The western portal bridge seen from the walkway by Crown Battery. Vehicle traffic uses the lower level, and the upper level was used by the railway. Now the upper level is foot and bicycle traffic only. The western rail tunnel portal, seen from the portal bridge. Looking out from the tunnel to the eastern portal bridge. The eastern portal seen from the bridge. 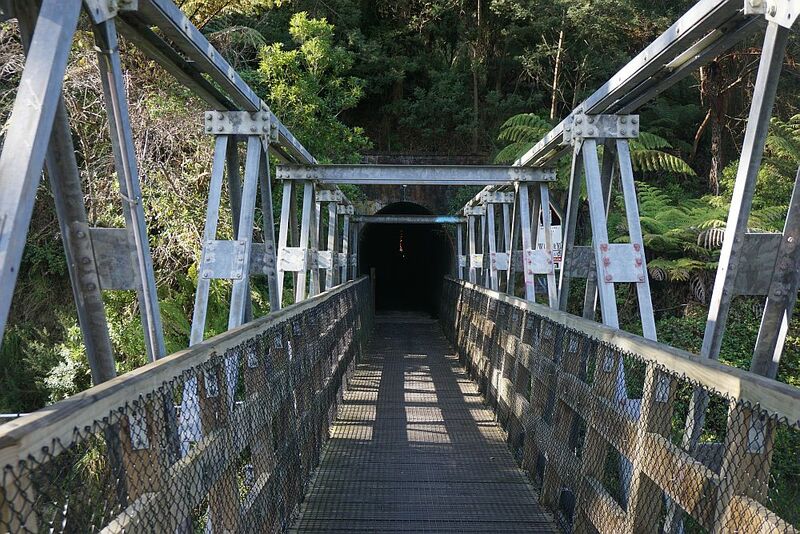 SH2 crosses directly over the tunnel portal. There is a short side track with steps from the walkway end of the bridge to the Ohinemuri River. 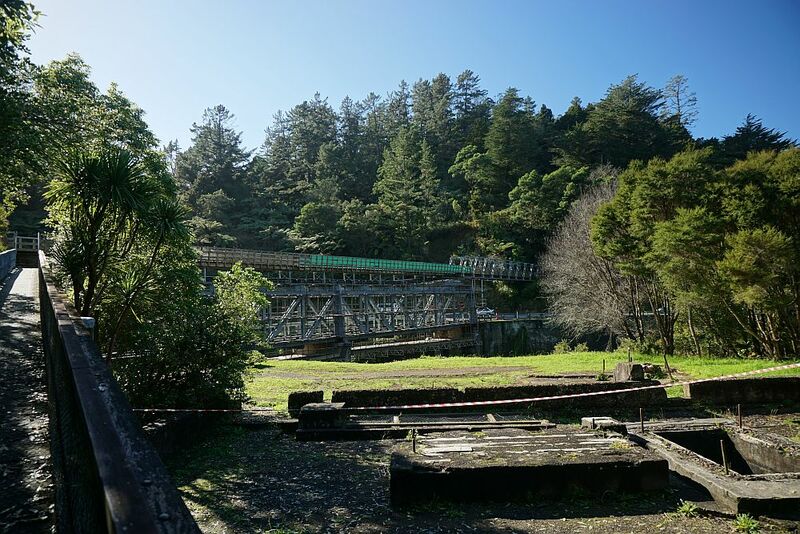 Here the eastern portal bridge and SH2 are seen from the banks of the river. A short side track by the walkway leads to a small waterfall (or trickle) by an old disused stone quarry. 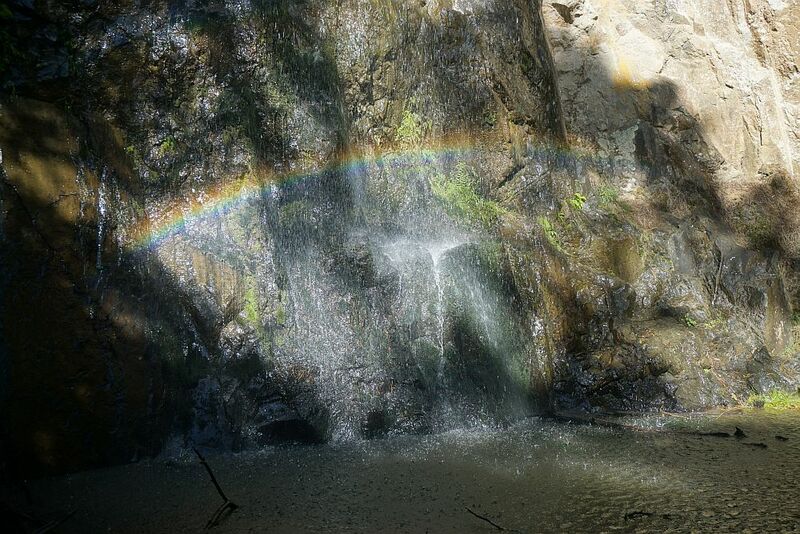 With the sun shining on the base of the falls there is a distinct rainbow, possibly with gold underneath it. 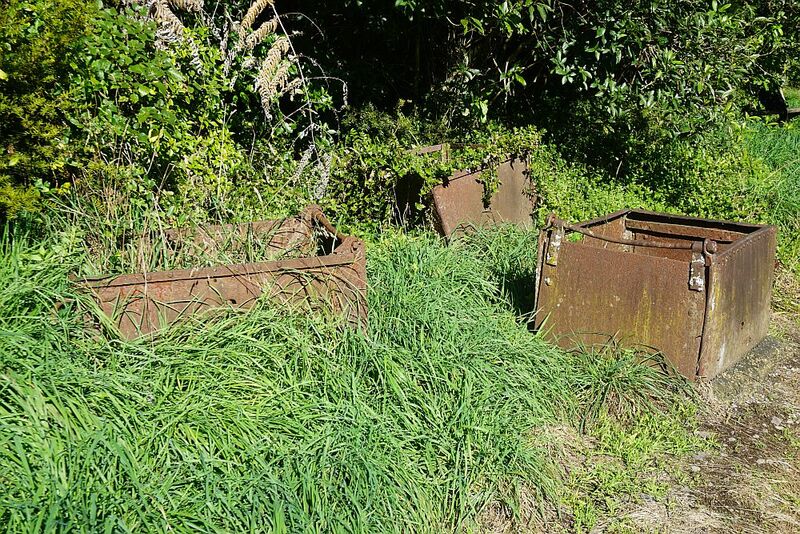 More relics from gold mining. This time trolleys used for transporting quartz ore. 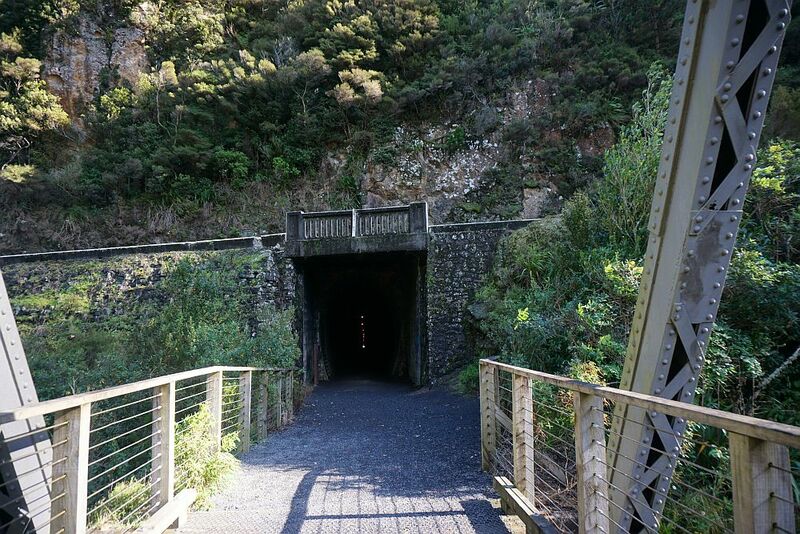 The walkway from the eastern portal to Owharoa Falls is wide enough for a vehicle. On fine days at weekends it is busy with walkers and cyclists. It runs alongside the Ohinemuri River. The walkway bridge by Waitawheta Rd. 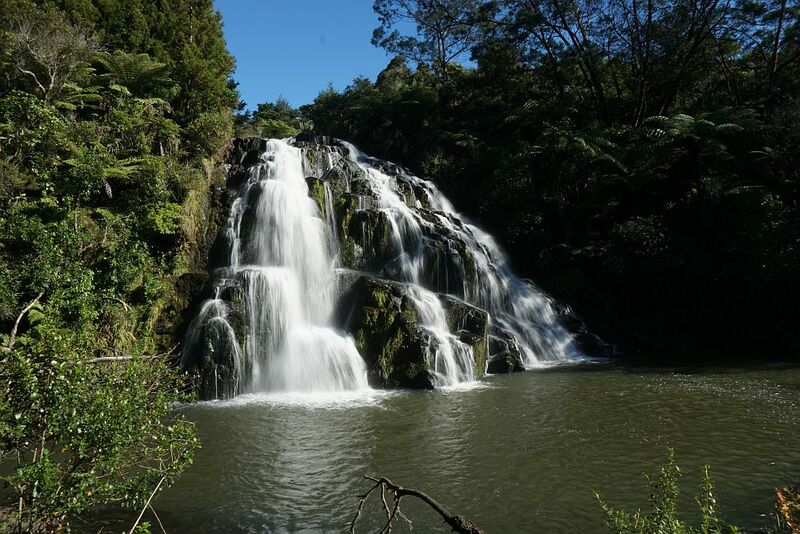 A short walk up Waitawheta Rd and a short track by a small parking area to the right leads to the falls viewing point. 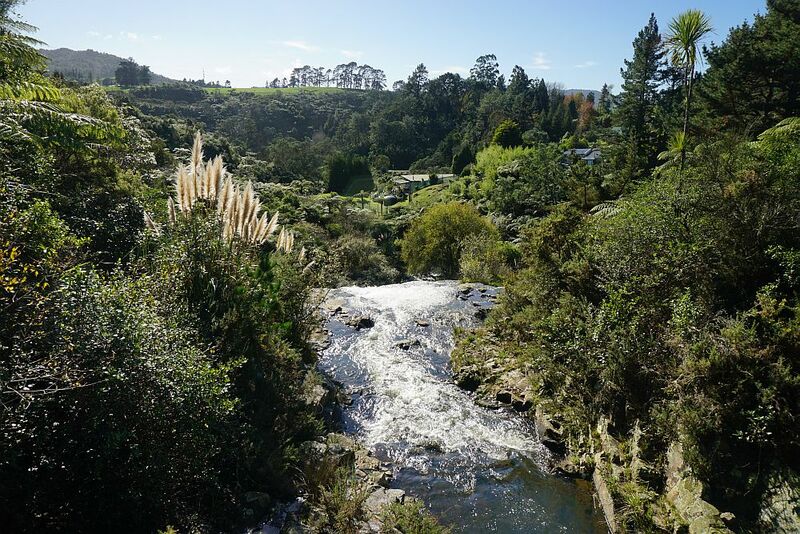 Owharoa Falls seen from the viewing area. 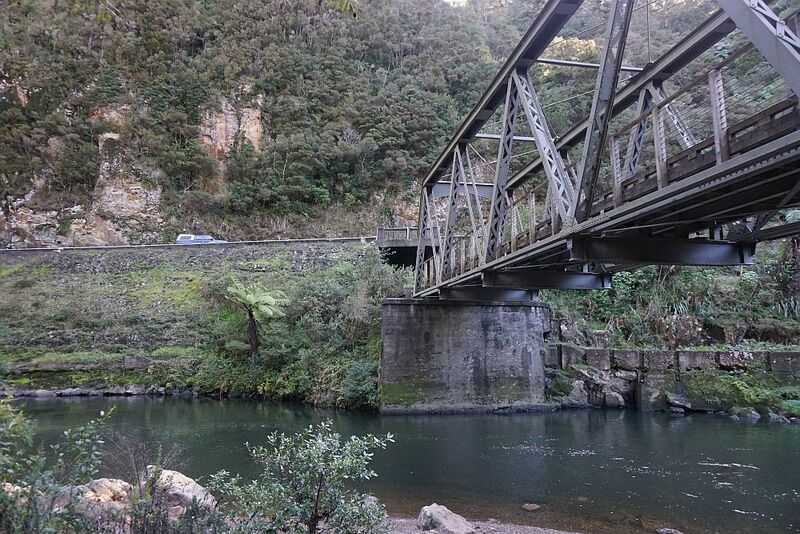 Waitawheta Rd crosses over the Ohinemuri River, but the falls are not visible from here. 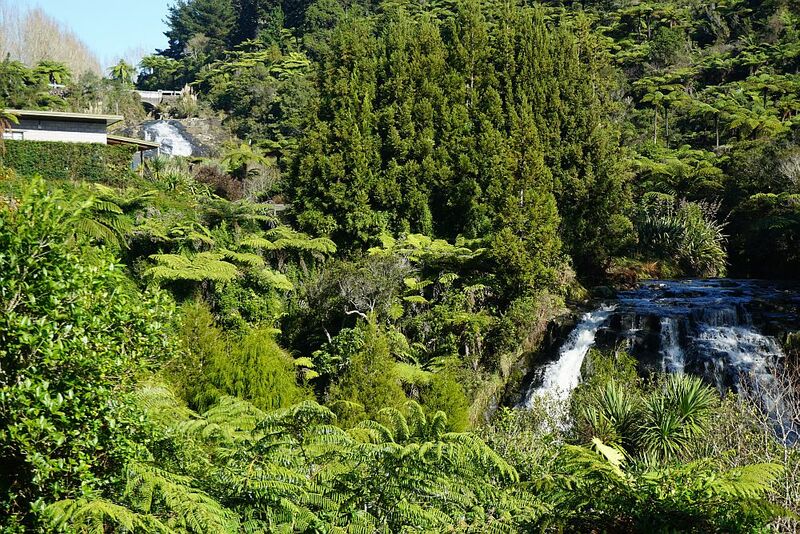 Many years ago the falls were clearly visible from SH2, but vegetation now blocks this view completely. 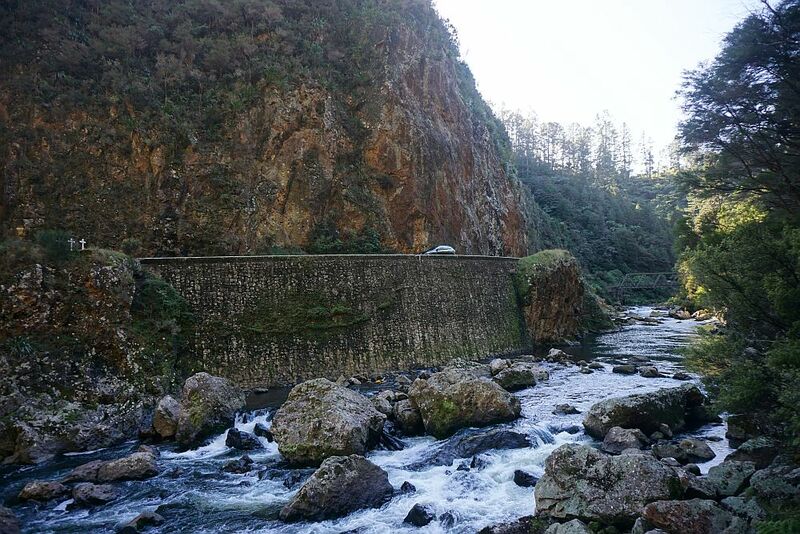 The Taieri Stream above the falls, viewed from the bridge on Waitawheta Rd, looking towards SH2. 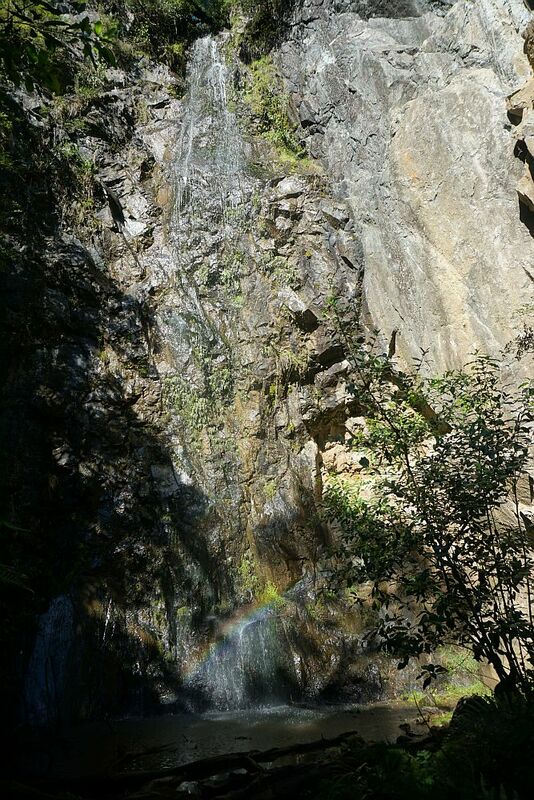 The falls consist of several steps, but only the lower step is visible from publicly accessible viewpoints. The upper falls can just be seen at top left by the building. The upper end of the lower falls can be seen to the right. Viewed from Waitawheta Rd. 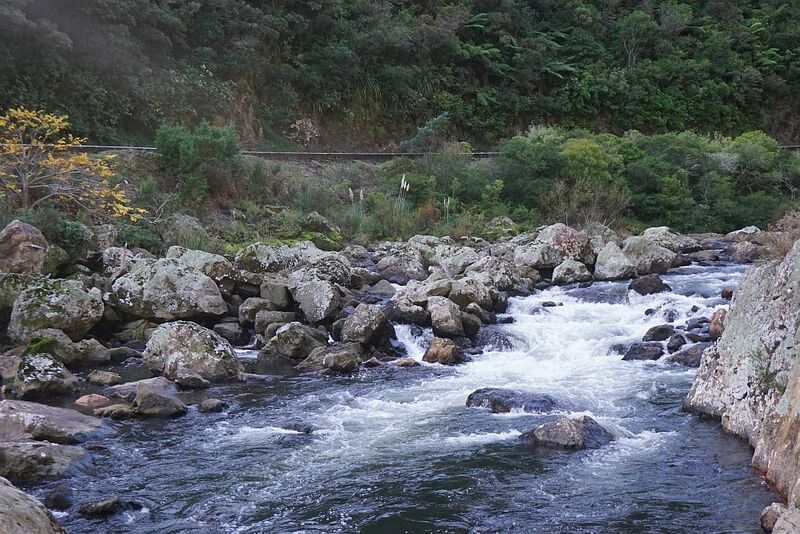 Rapids in the Ohinemuri River, with SH2 above, and the eastern portal bridge to the far right. The Ohinemuri River with SH2 to the left and the walkway to the right. 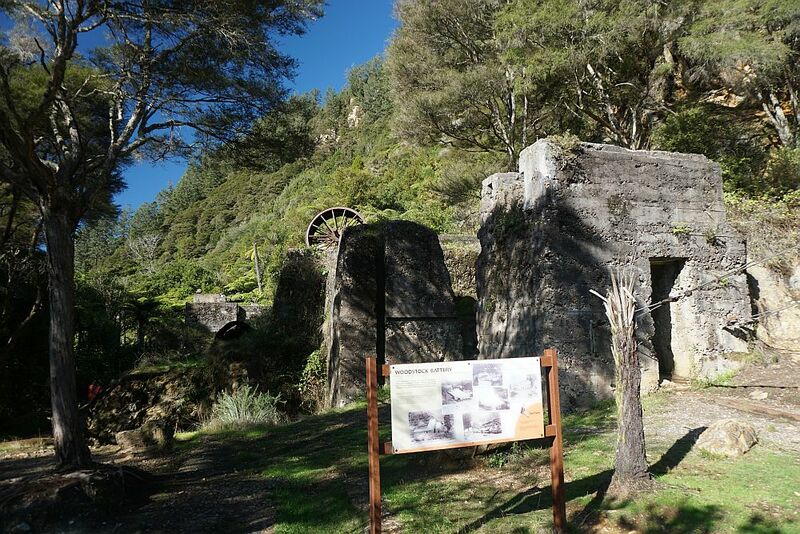 Remains of the Woodstock Battery by the lower Waitawheta Gorge bridge. 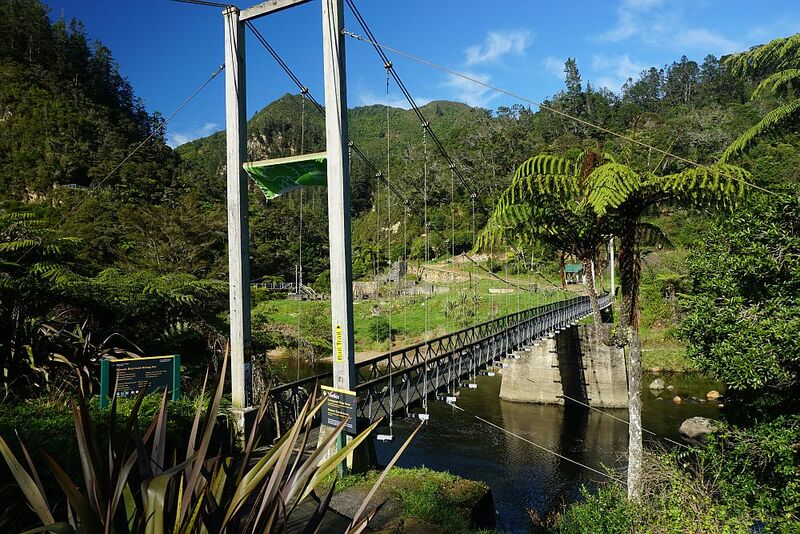 The lower Waitawheta Gorge bridge. 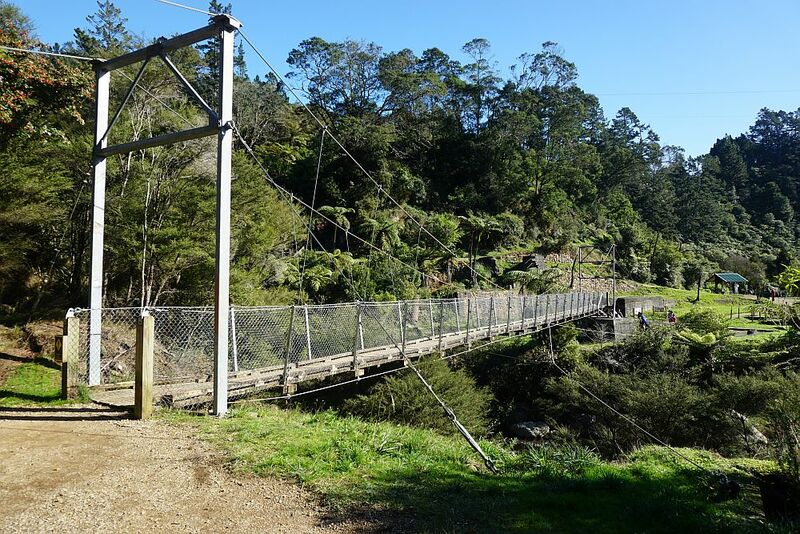 There just a short walk from here across the Ohinemuri River Suspension bridge back to the Karangahake Reserve. The GPS tracklog shows the route followed. The long straight stretch at the left is the rail tunnel where GPS signals are lost. About halfway along there is a short track to the quarry and waterfall. 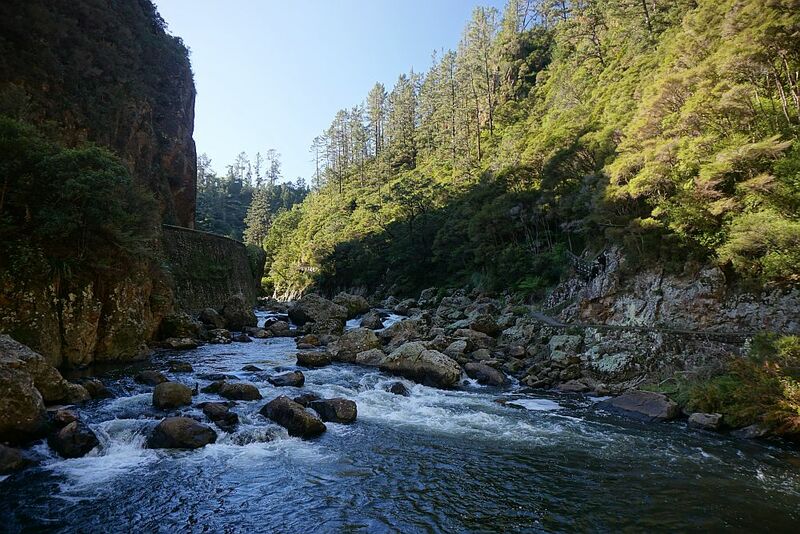 The Owharoa Falls is at the right hand end of the tracklog. Total distance was about 13.5 km, and total time 3 hours 15 minutes, including several short breaks and a picnic lunch break. 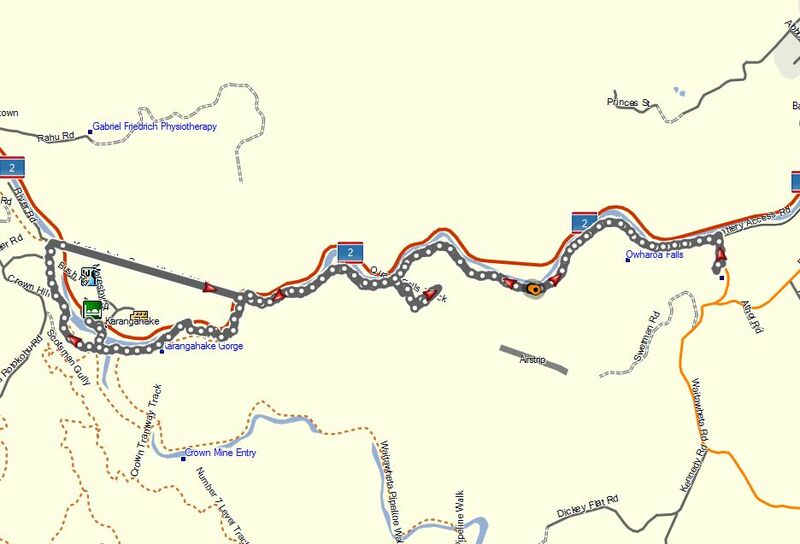 The tunnel loop on its own is about 3.8 km and would have taken about 65 minutes. 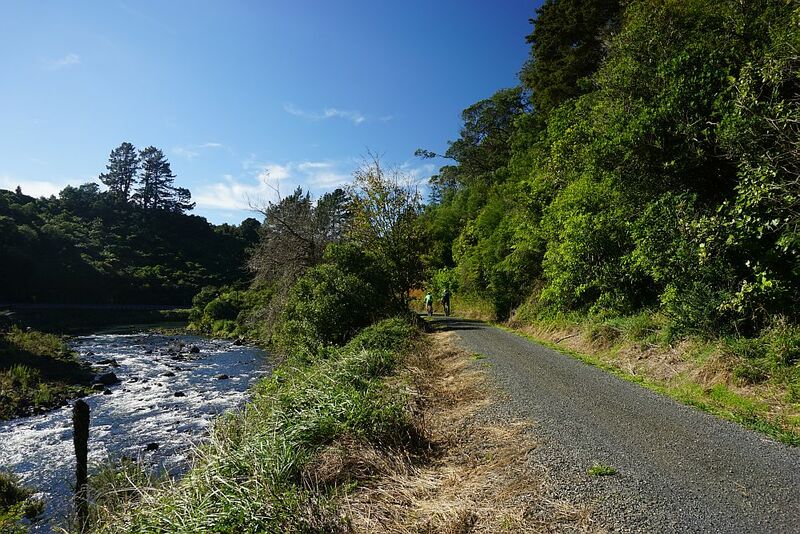 From the Owharoa Falls to the reserve is about 5 km, and took 1 hour 10 minutes to complete. The walk was done on May 16, 2015, with various parts of it walked on several previous occasions.